Bilaspur is a city in Bilaspur district in the Indian state of Chattisgarh. It is the second largest city in the state. Bilaspur is the commercial center and business hub of north east Chattisgarh region. The city is the headquarter of South Eastern Coalfields Limited. The city is also known for its rich, varied and colorful culture. Bilaspur city runs under the administration of the Bilaspur Municipal Corporation. The city has various archeological sites and temples which attracts tourists from all over the world. The city has developed as a centre of education and students from all over the state comes to Bilaspur to study engineering, medical and other competitive exams. The literacy rate of Bilaspur is 87.29%. 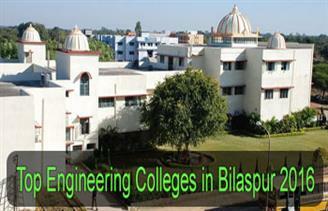 Here in this article we will discuss about the Top Engineering Colleges in Bilaspur 2016.